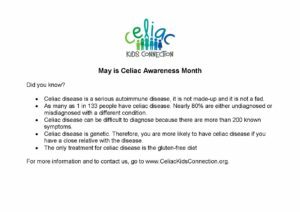 As Celiac Awareness Month (May) comes to a close it is time to reflect on the ways Celiac Kids Connection raised awareness. Awareness months are used to increase knowledge of an issue or celebrate something. This year we shared information about celiac disease and celebrated the positive impact this has had on some of our members’ lives. We provided knowledge with the introduction of the Celiac Science section of our website. This section explores the basic biology behind celiac disease. We talk about the immune system, autoimmune diseases, gluten, the small intestine and much more. Please visit this section. We provided a celiac disease fact sheet that could be shared to help friends, family members, classmates and co-workers better understand celiac disease and the gluten-free diet. Working with our wonderful physicians and staff at Boston Children’s Hospital we provided information about Gluten Detective and dispelled some celiac disease myths. Gluten Detective is an at home test to determine if you have been exposed to gluten. We celebrated positive experiences that would not have happened without celiac disease. One member shared about coming together as a family to advocate for their daughter at school. Another family shared about how the diet can be difficult but how happy they are that their daughter is so much healthier. And, one of our members, Kelly Farewell, told us how celiac disease actually led to a job offer. You can read Kelly’s story on our Facebook page. 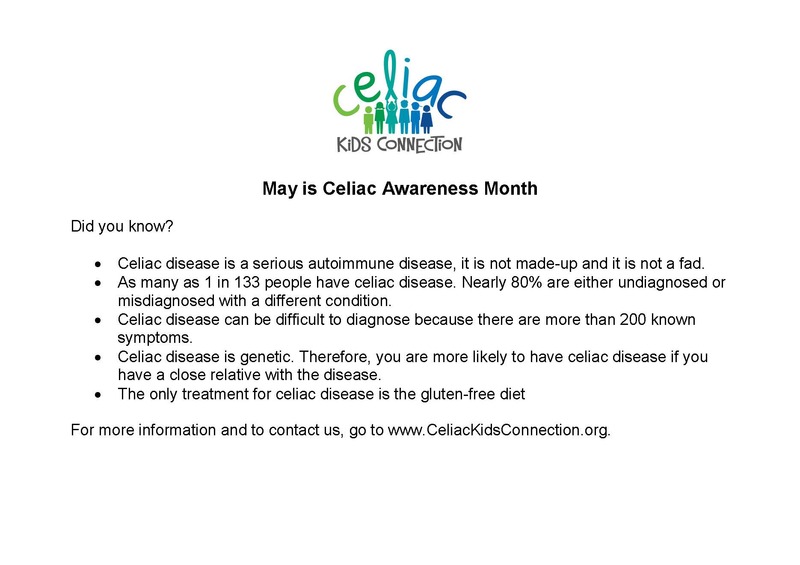 We hope you will continue to spread Celiac Disease Awareness throughout the year.